Unhealthy ties between Korean conglomerates and the government have long been cited as a factor that prevents Korea from moving forward. A recent comment by a chaebol chief at a parliamentary hearing over the alleged connections between businesses and the presidential office was a reflection of the reality. “It was near impossible to reject such a demand (from Cheong Wa Dae). That’s what it’s like in Korea,” said Huh Chang-soo, head of GS Group and chairman of the Federal of Korean Industries, at the hearing on Dec. 6. He was responding to lawmakers’ questions on why the FKI helped coerce conglomerates to donate funds to two foundations controlled by Choi Soon-sil, confidante of impeached President Park Geun-hye. Another reflection of the business climate in Korea was that most of the chaebol leaders seated at the hearing were second to third-generation heirs of the conglomerates -- not self-made businessmen. They are also in the top tier of a list of Korea’s 100 wealthiest people compiled by The Superrich Team. Joining them on the list are their relatives. Only 10 self-made entrepreneurs made it to the list in the past year. A total of 33 relatives from the families that control Samsung, Hyundai Motor, SK, LG, Lotte and other conglomerates dominate the country’s wealthiest list. The figure excludes the heads of major business groups. The combined private assets of the business moguls stands at 39 trillion won ($32.6 billion), higher than the annual budget of the Seoul Metropolitan Government at 27.5 trillion won. Lee Jae-yong, vice chairman of Samsung Electronics, and 10 other Samsung family members own 22.6 trillion won in total assets. The assets of Lee Kun-hee, the bedridden chairman of Samsung Group, is 15.64 trillion won, accounting for the largest portion of the assets. His wealth includes real estate in Hannam-dong, one of the richest districts in Seoul. Outside of the capital, Lee Kun-hee also owns a considerable amount of land in Yongin City in Gyeonggi Province, where the Samsung-made amusement park Everland and Ho-Am Art Museum are located. His properties there sit on 8,712 square meters of land. In total, Lee owns 14 real estate assets nationwide, worth 938.9 billion won. The women of the Samsung family also own a colossal amount of assets. The senior Lee’s wife Hong Ra-hee, director of Leeum Samsung Art Museum, and her two daughters Boo-jin and Seo-hyun, who lead Hotel Shilla and the fashion business at Samsung C&T, respectively, own 1.7 to 1.8 trillion won each. Lee Kun-hee’s sister Myung-hee, chairman of Shinsegae Group, holds 1.3 trillion won. Hong’s siblings also dominate Korea’s business landscape including areas such as media, retail, investment capital and art. Hong Seok-hyun, chairman of Joongang Media Network, a parent company of Joongang Daily Newspaper and television network JTBC, is one of Ra-hee’s brothers most known to the public. Other siblings include BCG Retail Chairman Seok-jo, Bokwang Investment Corp. Chairman Seok-joon, and Leeum Samsung Art Museum Vice Director Ra-young. The combined value of the Hong family – excluding Hong Ra-hee -- is estimated at around 1.24 trillion won. 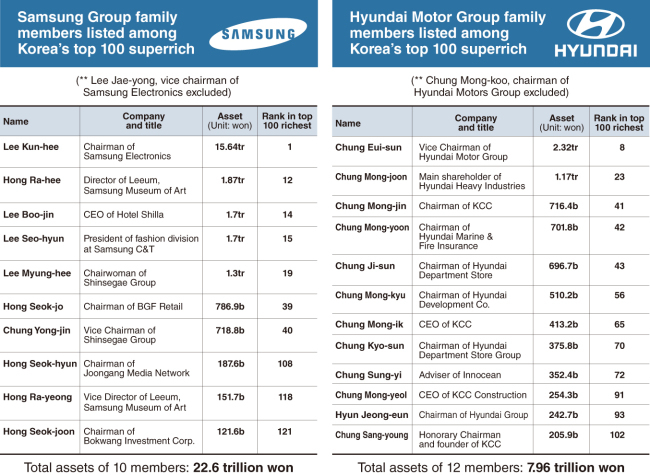 The family of Hyundai Group may hold a smaller fortune than the Samsung family, but twelve of them are included on the 100 wealthiest people list, the largest number among the top five conglomerates. Chung Eui-seon, vice chairman of Hyundai Motors and son of Chairman Chung Mong-koo, owns the largest value of assets at 2.32 trillion won. Hyundai Motor Group chairman’s younger brother Chung Mong-joon, the biggest shareholder of Hyundai Heavy Industries, follows with 1.17 trillion won. Other assets of the Chung family surpass 500 billion won. Other family members include KCC Chairman Chung Mong-jin, Hyundai Development Chairman Chung Mong-kyu, Hyundai Marine & Fire Insurance Chairman Chung Mong-yoon and Hyundai Department Store Chairman Chung Ji-seon. Hyundai Group Chairwoman Hyun Jeong-eun is also included in Korea’s top 100 wealthiest list, with 240 billion won. Hyun is the wife of the late Chung Mong-heong, the former chairman of Hyundai Asan. Hyun was recently accused of intentionally omitting several Hyundai Affiliates on a list of companies subject to cross investment. The antitrust regulator Fair Trade Commission pressed charges against Hyun in October. SK Group, the country’s third-largest business group, has two businesspeople listed on the Superrich Team’s top 100 wealthiest list. Chey Ki-won, a director of the board at SK Happy Nanum Foundation and younger sister of SK Group Chairman Chey Tae-won, is the richest SK Group family member. Chey holds more than 1 trillion won worth shares in listed SK affiliates. In addition to the stock assets, she was paid an additional 18.75 billion won in dividends. The value of her paid dividends is the largest among the 125 relatives of the nation’s 17 superrich on a list by Forbes Magazine. Chey’s massive real estate assets include a building that was the former headquarters of JYP Entertainment in Cheongdam, southern Seoul. Chey purchased the around 1,085 square-meter building for 7.6 billion won in 2014. Another Chey family member, Chang-won, vice chairman of SK Gas and SK Chemical, was listed among Korea’s top 100 richest with 370 billion won of assets. LG has seven family members on the Superrich Team’s top 100 richest list. Chairman Koo Bon-moo’s brother Bon-sik, who leads Heesung Group as its vice chairman, is the wealthiest among them with assets of more than 1 trillion won. Another brother, Bon-neung, chairman of Heesung Group follows with 904.8 billion won. He is also head of the Korea Baseball Organization. The remaining five LG family members on the list include Chairman Koo’s wife Kim Young-sik. The combined assets of the five members are estimated to be worth around 2.5 trillion won. Lotte Group has two of its business moguls on the top 100 richest list. One of them is Lotte Group founder Shin Kyuk-ho’s eldest son Dong-joo, who is the chairman of SDJ Corp. While still in turmoil over power succession, Dong-joo stands strong, backed by 1.64 trillion won of publicly traded stock assets. Added to this, he also owns 27 billion won of assets from unlisted firms. His father Shin Kyuk-ho’s wealth follows with 270.5 billion won, according to public data. The value of real estate assets under the founder is astronomical. His land assets were estimated to be worth 18.6 trillion won in 1988. Shin was then picked as the world’s fourth-richest man by Forbes magazine. Shin’s 15 real estate assets in Korea sit on over 1 million square meters of land worth 305 billion won. Apart from Shin Kyuk-ho’s private land assets, Lotte affiliates are known to own 5.7 million square meters of land in the country, a size that nearly doubles that of Yeouido in Seoul. Out of the 125 rich businesspeople on the list of Korea’s wealthiest, 89 of them boosted their wealth through their family connections, while only 36 were self-made entrepreneurs.